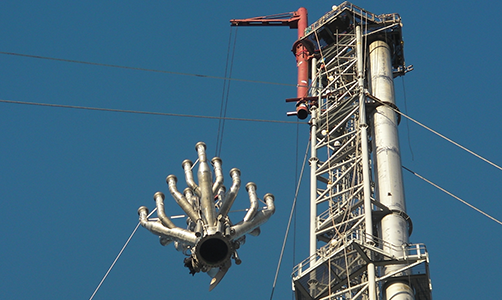 Flare Tip Replacement without the use of helicopters or cranes. Tip replacement using crane or Zenith’s purpose made lifting davit. All required rigging studies and temporary works design. Grit blasting and paint application. ASME IX Qualified, Site welding facilities. We have pioneered the design of a purpose-built davit to improve the process of replacing flare tips. The davit is positioned directly below the termination point of the flare stack thereby negating the use of expensive cranes. This has been designed to take the weight of the tip as it is lowered to the ground and lift the new replacement tip into position. This innovative solution to a complex and expensive problem is now being adopted in refineries, petrochemical plants and offshore platforms around the world, and is an excellent example of our design capabilities delivering commercial benefits often in remote and demanding locations.